Mars Global Surveyor MOC Celebrates 2 Years in Orbit! 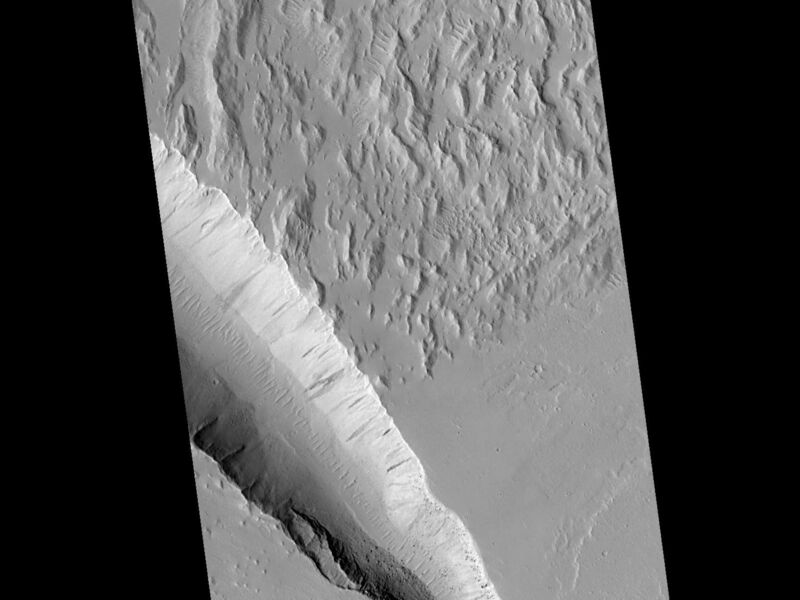 This pair of Mars Global Surveyor (MGS) Mars Orbiter Camera (MOC) images shows a variety of geologic features along the eastern edge of the Gigas Sulci (the rough, ridged surface at upper left in each picture) in western Tharsis. 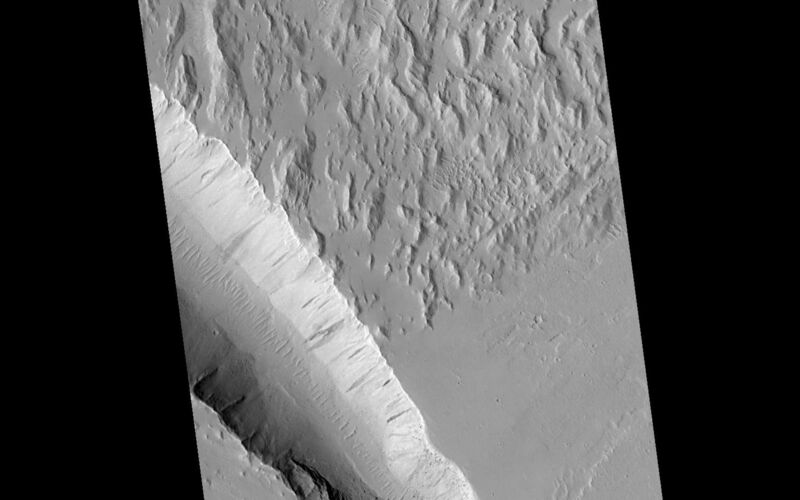 This is a volcanic region located approximately 750 km (470 mi) northwest of the Pavonis Mons volcano and 350 km (220 mi) southeast of the Olympus Mons volcano. 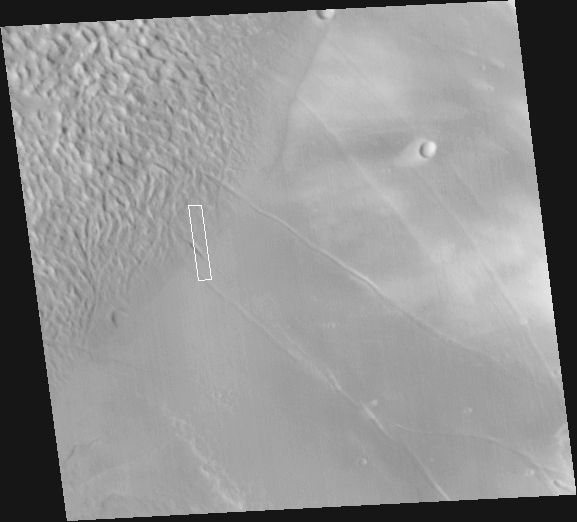 The regional view (above, left) is a MOC wide angle context image showing the location of the higher resolution, narrow angle camera view (above, right) as a small, white box. The upper left portion of the context image shows a rough, hilly terrain--Gigas Sulci--that is cut along its margins by several troughs that look something like gashes made by a giant knife. Also in this scene are several impact craters, including one (upper right) with a bright, teardrop-shaped "tail" formed by wind. The context frame covers an area approximately 115 kilometers (71 miles) across and is illuminated from the left. North is up. 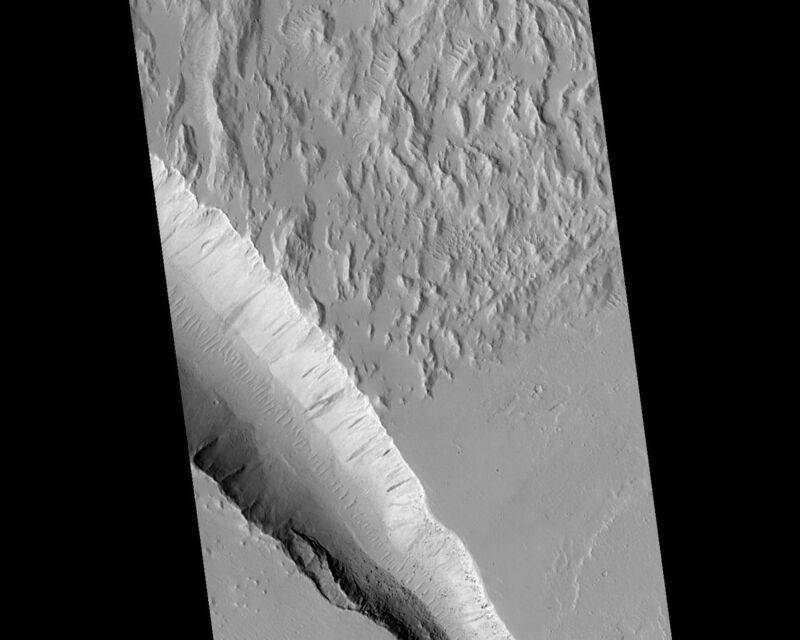 The high resolution picture (above, right) is a MOC narrow angle camera view of a 3 km-(1.9 mi)-wide area along the edge of the hilly, Gigas Sulci terrain. This image shows a range of interesting geologic features. The Gigas Sulci consist of steep, somewhat mountainous terrain, but the valleys and some of the slopes between these hills appear smooth and mantled (perhaps by dust). Small, parallel ridges on some of the valley floors are probably windblown dunes. The edge of the hilly terrain is cut by a deep trough caused by faulting and down-dropping of the terrain in the center of the valley. The slopes of this valley exhibit dark streaks caused by small landslides. Boulders the size of small buildings can also be seen on some of these slopes. This deep trough and another, shallower one to the south (lower left) cut across lava flows, indicating that the troughs formed after the lava flows were emplaced, cooled, and hardened. The trough at the lower left has slumped and terraced walls. As in the context frame, nor this up and the sun illuminates the scene from the left. For a full-resolution (3.7 meters--12 feet--per pixel) view of the narrow angle camera image (2.9 Mbytes), Click HERE.